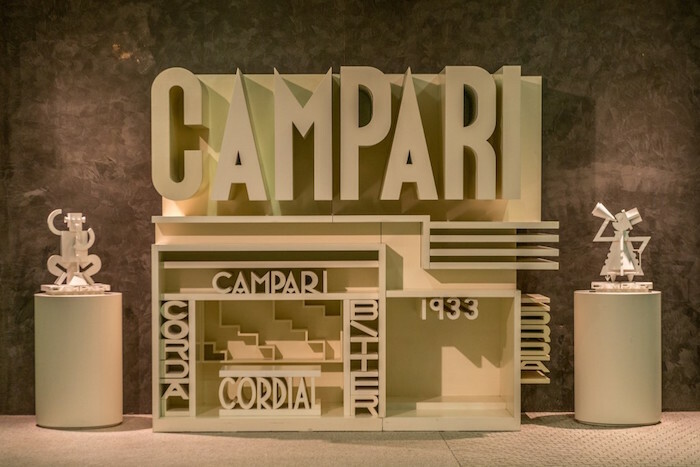 A dynamic, interactive and multimedia space that contains more than 150 years of the iconic brand Campari, narrated for MyTemplArt by the director Paolo Cavallo. Not only an aperitif, but a style of life. This is the aura that great artists such as Fortunato Depero, Bruno Munari, Ugo Nespolo, Marcello Dudovich embroidered around the brand Campari for years. Campari Gallery expresses this engaging story showing the testimonies of the continuos and active fil rouge of product, art and communication, that always distinguished the image of the brand. There’re famous carousels of ’70s, real tales in which the réclame of the product took place only in the last few seconds. Advertising spots, calendars signed by the most important photographers and embodied by international stars, amazing posters from Belle Epoque, advertising posters from ’30s to ’70s, the “Canzoniere Illustrato” and others. An exhibition which gives little space to the representations of the machines for the production, moved in 2004 to Novi Ligure but still reflects the soul of the new headquarter of the brand in Sesto San Giovanni, founded by Davide Campari in 1904, transformed by the architect Mario Botta between 2007 and 2009. We talk to the director of Campari Gallery, Paolo Cavallo, about the iter inside the story of the red aperitif. Alessandra Ghinato: How the idea of the company museum born? Which goals the gallery has got? Paolo Cavallo: It was born in occasion of the 150° anniversary of Campari with the aim to give to consumers and the passionated a place which tells the story of the brand, of the company, of its advertising communication, of the link with the world of art. The project wants to create an emotional, multimedia and interactive space, not only a celebration of the past but a place where the visitor is launched from the works of the past to the contemporary values of the brand. 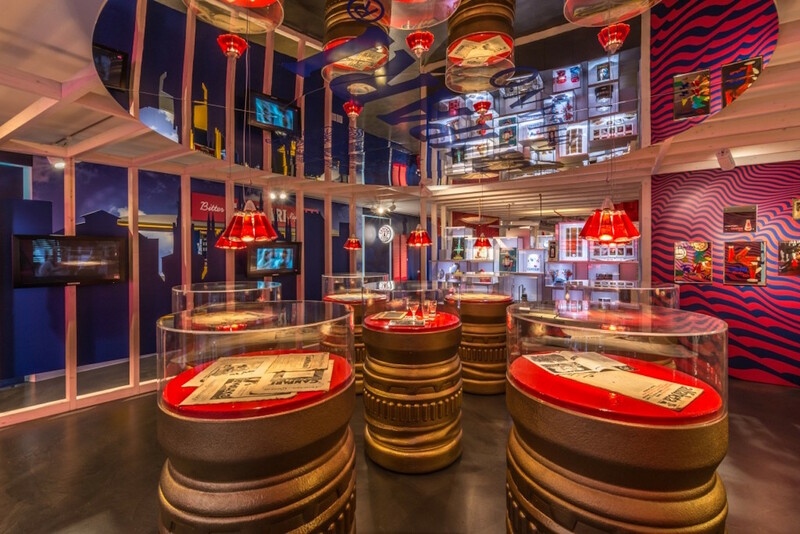 Campari Gallery was developed during the urban transformation of the historical Campari factory of Sesto San Giovanni to the new headquarter of the group and came from the decision to maintain the original unit of the place of the first Campari factory and the new Company Museum. A.G.: The story of Campari is recognized as emblem of synergic collaboration between art and company. What are the iconic artists of the brand? Paolo Cavallo: Leonetto Cappiello, Marcello Dudovich, Marcello Nizzoli, Fortunato Depero, Bruno Munari, Ugo Nespolo are some of the most representative artists thata deeply marked our communication with their artworks. Fortunato Depero started the collaboration with Campari in the 1926 for ten years. Artist among the most important of Futurism that legitimized the advertising as art, creating a total osmosis between them. With his incisive and immediate style produced for Campari more than 100 drawings, 60 of them are part of the historic archive and other 40 are placed in recognized institutions, such as Mart in Rovereto, Casa Depero and important private collections, such as Mattioli collection. These artworks are very known and requested from international museums, seven are currently at the glass museum of Murano for an exhibition on posters dedicated to the aperitif, ten have been provided to the Guggenheim of New York at the beginning of 2014 for an exhibition about Italian Futurism, fifteen borrowed to Juan March Foundation in Madrid for a show on Fortunato Depero in 2014, two sculptures and five inks were exhibited at Triennale in Milan for Arts & Foods in 2015. Bruno Munari collaborated with Campari at the end of the ’20s till the ’60s with the famous manifesto, then started again in the ’80s. Many internationally well-known film-makers signed our commercials. For example, in 1984 Federico Fellini shot his first advertisement for a private brand. Thanks to the advertiser Franco Scepi, our aperitif was promoted by the Woman in Red, the protagonist of the homonym movie by Gene Wilder, pretty famous in the ‘80s. A.G.: How does the brand express itself in the contemporary creativity? Paolo Cavallo: Ugo Nespolo collaborated at his first project in 1990 for the World Cup and he’s still working with us. In 2015 he projected a special label for the 3 litres limited edition bottle with the reinterpretation of the four most important cocktails realized with Campari. The designer Matteo Ragni projected the Triennale of Milano, institution we supported for three years. Beyond great artists and designers, we have collaborated with important film-makers and photographers. The current advertisement was shot by the film-maker Joel Schumacher and focuses the communication on the aperitif as social moment, contrary to the commercials from ’80 to 2000, focused on couples, on the wait of what could happen. The Indian film-maker Tarsem Singh signed a trilogy which made to appear, for the first time, on italian screens the female homosexuality in an amazing commercial set in the central station of Milan with scenographic painting of the artist Tamara de Lempicka. Furthermore every year on Campari calendar international stars are portrayed by talented and famous photographers, such as Giovanni Gastel or Mario Testino. A.G.: Are pieces of the collection used for marketing to promote your company? Paolo Cavallo: In the last years, Art Label project have seen the valorization and reinterpretation of advertising images and drawing of many artists. Nespolo reinterprets the spirit and Depero’s drawings in two limited editions in 2014 and 2015 and gives a new lecture of a 70 years old advertising. Last limited edition depicts an fair pavilion in occasion of Expo in 2015. In 2014 for the 110 years of presence in Sesto San Giovanni, eleven street artists interpreted 110 metres of fencing wall of the public park nearby our headquarter for the project Redvolution 2.0. The wall was divided in eleven sections of ten metres for each artist and eleven manifestos of our archive were recreated, bonding the past artworks with the contemporary street artist thinking and requalifying a degraded environment of our city. A.G.: What is the public of your gallery? Paolo Cavallo: Our public is wide, it comes from every part of the world, also from far countries such as Canada and Argentina, of every age and social and cultural class. They are consumers and passionated, common people interested in the brand heritage, art lovers. Campari Gallery is visited by many cultural associations and school institutions, from Secondary Schools to Italian and international Universities. With some universities we have established a partnership, for example with the London Business School. Every years for the Master students we organized a meeting session with our CEO and investor relator who talk about the company and then they visit the gallery. Our visitors are also barman, bartender, professionals of beverage sector and the students of the courses of Campari Academy. A.G.: Any future initiatives and projects? Paolo Cavallo: We will continue Campari on Tour, project in which part of the collection is exported out of the gallery. In 2013 we were in Vienna in occasion of a 15-days event about fashion and art, last September we were in Paris for a big event of our French distributor. For the Brera Art Week we were in two galleries in Brera district in Milan. Now we are working to take some posters to a bar in London on August and September and maybe we will go in Australia in two important art galleries in Melbourne and Sydney. We will do other two Campari Wall, after the current “Different Perspective” dedicated to the German artist Barbara Probst exhibited until July 9th. In September we will open our big exhibition of 2016, about which I can’t unveil anything.